The use of bow ties was common a few decades ago and then it diminished with time. Lately there has been resurgence in the bow tie usage with youngsters and even veterans taking a liking to it now. People now have a new found love for the bow ties which had faded into oblivion for some time. This time there is a difference as people seem to take a different approach to styling with the bows. Earlier it was not very frequented to informal events but today you can have a style edge with creative bows available. Bow ties are considered as a strong part of any man’s fashion statement. This is definitely true due to the focus a person manages when he has worn the perfect bow tie to go with his attire. Not everyone can be so focused to grab the best bow ties to suit their styling. This is why it is important that when you are planning to look out of the ordinary don’t forget to checkout unique bow ties. Unlike the past now bow ties are taking a new approach of styling with makers ready to give a different look to them. They have come a long way since the days off only black bows making it to the gatherings. Now even people are accepting the creative designing and colors used for bows. Many of the events that you frequent can be made a perfect occasion to show off your new bow tie. This is the perfect time to experiment with your fashion desires and go all out trying. Although there are many who would prefer the black bow over anything else at the formal occasions still you can make a distinctive bow look really cool at times. It is all about how you present your styling among the people when gathering for a specific event. Not everyone is able to pull off something unique and this is why you need to be sure about it. Rest of the things would eventually fall in place. Now a day we all have so many social gathering to appear very often. These are just the right place to be wearing out some of the more vibrant and new bow ties that you might have bought. Wearing the same old black bow is just mundane and can make you look all too formal for a not so formal event. Nobody wants to end up looking like a grumpy old man at an event to enjoy. With the new styles of bow ties making it to the stores you should not be too worried about wearing them anymore. 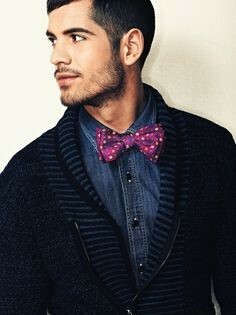 People have now embraced the unique bow ties with open mind and men can now present the new styling without any doubt in their minds. Check on the event or occasion with your distinctive look and make people compliment on your appearance. Only black bows are the thing of past as modern guys are making it grove with vibrant colors.